Cloudy skies this morning will become partly cloudy this afternoon. Slight chance of a rain shower. High 76F. Winds SSW at 10 to 20 mph.. Partly cloudy this evening, then becoming cloudy after midnight. Slight chance of a rain shower. Low 48F. Winds W at 10 to 15 mph. 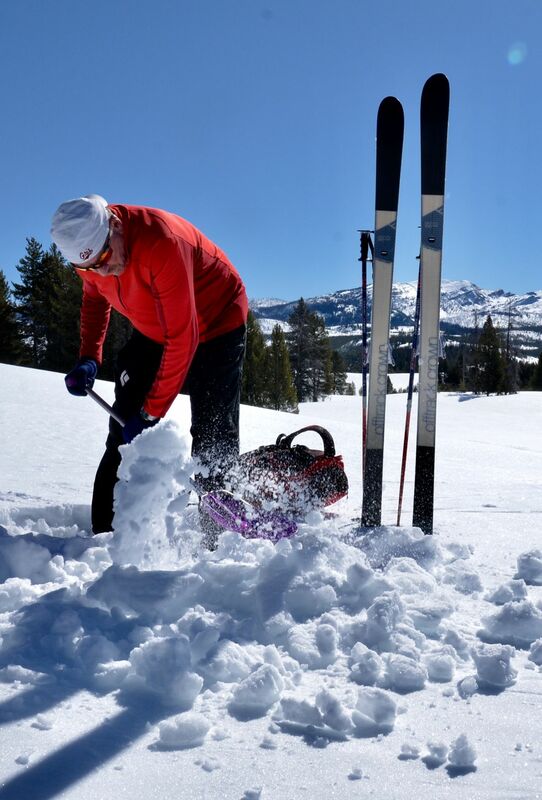 Easy slopes and wide-open meadows make spring skiing along the Bighorn Pass trail into Yellowstone National Park an ideal spring-skiing destination. Rick Graetz digs a snow pit for lunchtime comfort along the trail to Bighorn Pass in the northwest corner of Yellowstone National Park. A firm crust of snow makes for easy cross-country skiing in early spring. Wolf tracks the size of a man's palm hint at the wildlife roaming Yellowstone National Park's northwest corner in winter. While not as popular for animal-spotting as the park's Lamar Valley, the Gallatin River headwaters supports lots of small mammals and a variety of birds. Frost crystals decorate the brush tall enough to poke through 6 feet of snow along the Bighorn Pass trail in Yellowstone National Park. YELLOWSTONE NATIONAL PARK – A wolf laid the first marks. Skate skiers put down the next set, followed by a group on cross-country skis. Shortly after the sun crested Crowfoot Ridge the blank white page of the Bighorn Pass trail was illustrated by travelers exploring one of Yellowstone’s least-visited corners. Although the thermometer struggled to reach 10 degrees at the start of the last day of March, weeks of frigid sunshine had hardened the top of the snow like sugar crust on pastry. A booted foot would poke through, but skis can glide through the fingernail-thick dusting of spindrift with just enough traction to make travel effortless. Graetz’s only objection was the number of tracks he found in places he used to have exclusively to himself. The tail of the Gallatin Range gets lots of summer backpacker action, but has much less winter attention. Yellowstone’s winter traffic barely blips compared to the summer crowds. On average nearly a million tourists enter in July, compared to about 21,000 in March. Interestingly, barely that many people a year qualify as “backcountry visitors” by spending a night off the park’s paved facilities. The Gallatin Range doesn’t offer easy viewing for wildlife like the Lamar Valley does, unless you know your animal tracks. Then places like Fan Creek present a detective’s trove of activity to decipher: big-footed hops of snowshoe hares pursued by the tiny paws of a weasel; the coiled launch and landing of a coyote leaping over a stream channel; the nonchalant lope of a wolf leaving prints the size of a man’s hand. Sunshine turns those marks inside out in a day or two. Body weight compresses the snow into ice, which melts slower than the surrounding surface, leaving Braille-like bumps of testimony to past passage. Skiers on untracked snow pass in near silence, but crossing the trail of another makes the skis clatter like rocks in the back of a pickup. Yellowstone’s original boundary was a sharp-edged rectangle 55 miles east to west and 65 miles north to south. In 1929, the same year Congress created Grand Teton National Park, it also scruffed Yellowstone’s northern and eastern borders. The east side involved a big zig-zag land swap biting into the Shoshone National Forest south of the Northeast Entrance but giving back park land surrounding the East Entrance. The deal also added a knob to the northwest corner of Yellowstone capturing the headwaters of Specimen, Daly and Fan creeks. Highway 191 slips into Yellowstone as it follows the Gallatin River south of Big Sky. The park doesn’t have an entrance facility there, and the road skirts south along the Montana-Wyoming border for a few miles before crossing back into Montana at Grayling Creek and terminating in the town of West Yellowstone. The park’s northwest corner was already festering with anglers working the recently ice-free Gallatin River. Many trees along some flat stretches of river had their bark stripped 4 feet above the shoreline by blocks of ice after a breakup earlier in March. A large pond just west of the Bighorn Pass trailhead showed the grinding effect of the breakup. The ice scoured the wetland down to the sagebrush, leaving a muddy blotch in the middle of otherwise pristine snowfields. Farther upstream the snow remained so thick the river’s course could barely be detected. Yellowstone’s interior roads open to car traffic on April 19. Until then the nonmotorized crowd has a special time to itself.